Easter saw a return for me back to what I love- going up and down hills! 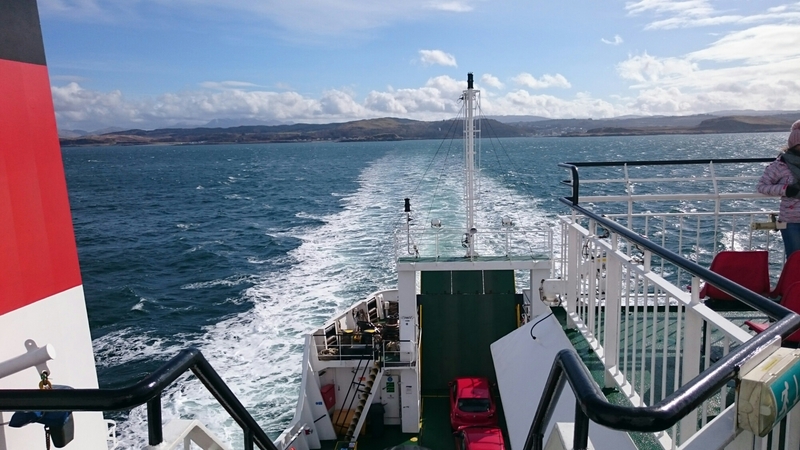 On a sunny Bank Holiday Friday, me and a few friends met in Glasgow, piled into a car and headed for Oban to catch the ferry to Craignure on the Isle of Mull. Once in Craignure we wastes no time setting off straight up Dun Da Ghaoithe. Up a track, past two masts and then the track dissolved into silent countryside. 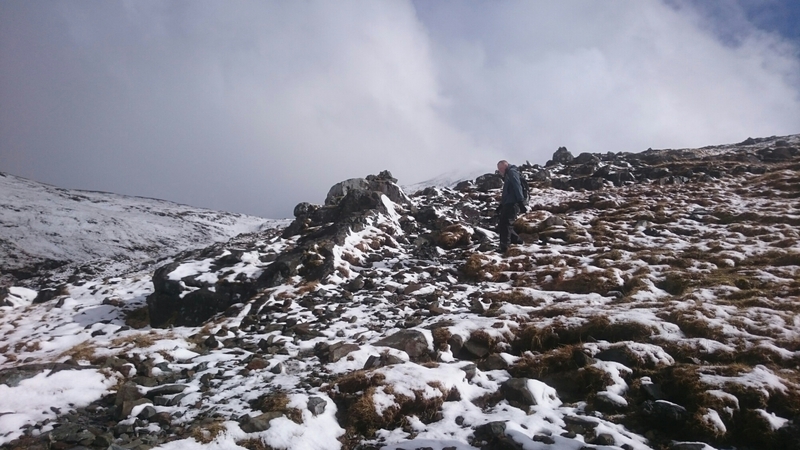 As we got higher up the Corbett the visibility diminished and I was soon navigating us by map and compass. As we got higher the winds picked up: 30mph, 40, then higher still, whipping us off our feet at over 60mph, with a long drop to our right. We summited, then faced the same treacherous winds on the descent. Once back below 400 metres, it was like someone turned the wind generator off and it was a straightforward stroll down the rest of the hill. The Saturday greeted most of us with hangovers (thanks Mishnish pub in Tobermoray!) However I hadn’t travelled for nine hours non-stop from London by tube, train, car and ferry to lie in bed feeling sorry for myself. Given the incessant rain, I plotted a trail run that took me and a friend from the east coast, along the length Loch Frisa. This was the longest run that I’ve done since my knee procedure, and I was pleased with it, despite the slow pace. The Sunday greeted mosted of us with hangovers (thanks again Mishnish pub in Tobermoray!) However the late start favoured us as we were waiting for the dregs of Storm Katie to break before heading up Ben More on the southern half of Mull. From sea level to the north of Ben More, the highest peak on Mull, the weather still did not look impressive as we got out of the car at midday. 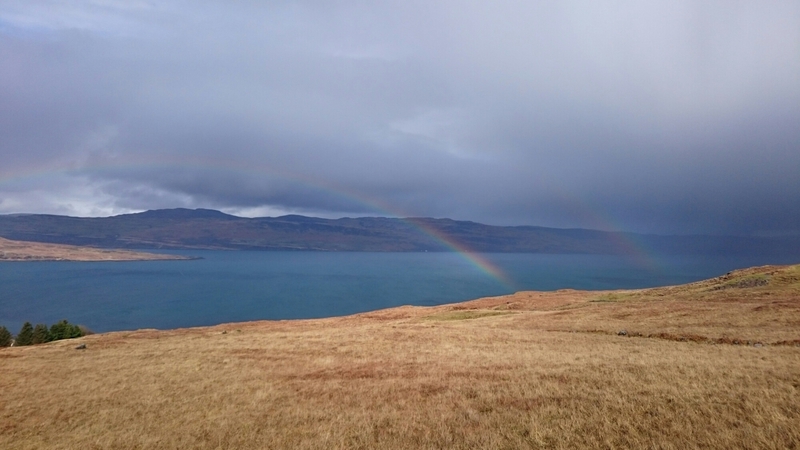 However, the weather improved and treated us to great views of a double rainbow back down the mountainside. Further up the mountain, the weather changed again and visibility dropped as we entered cloud, with snow underfoot. I cursed my compass, which seemed to be stuck, and I’d have tap it and shake it to get sense out of it. It was only the following day that I got confirmation that there is magenetic interference in this area! There’s no ‘serious’ nav involved, but it’s always a bonus to know exactly where you are on the mountain. Cloud soon turned into blizzard; hail whipped us sideways in strong winds. The ground was barren, save for ice smeared on the rocks by wind. Avoiding a cornice on the final section, we reached the summit and shortly after set off back down the mountain. 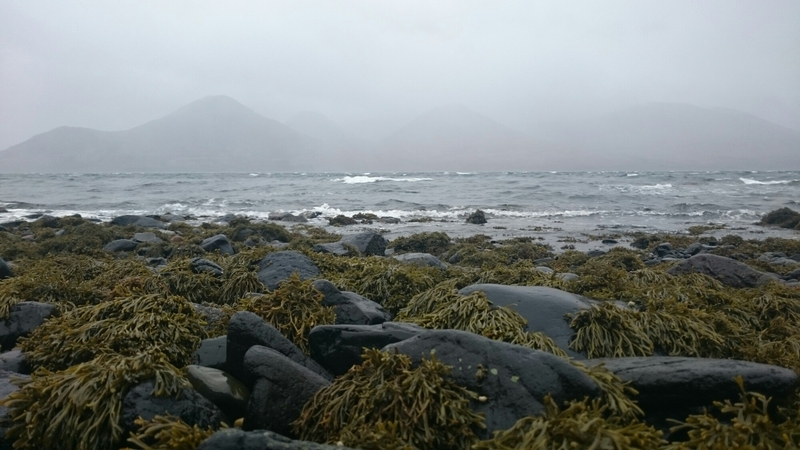 The few days I spent on Mull reminded me to be prepared for any weather when on the mountains, as well as the importance of knowing exactly where you are, rather than blindly following a path which may eventually peter out just as visibility drops. All in all, a great excursion to a remote part of the Highlands! Amazing photos. Awesome account of a great weekend too! !